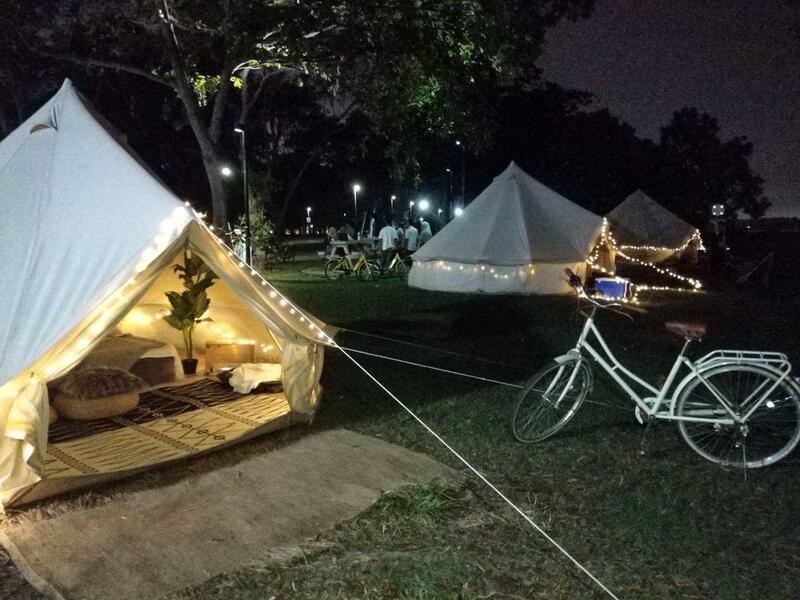 Glamping City Singapore Co-Founder Set On Building "Glamping Village"
Since the introduction of ‘glamping’ to Singapore by the first glamping company here, people are increasingly trying this new staycation alternative. Glamping, as most of you would know by now, lets you camp outdoors in style and comfort. No more having to deal with flimsy tents that claim to be easy to set up, or having to lug a load of equipment to the campsite. Plus, you get Instagram-worthy setup without breaking a sweat. 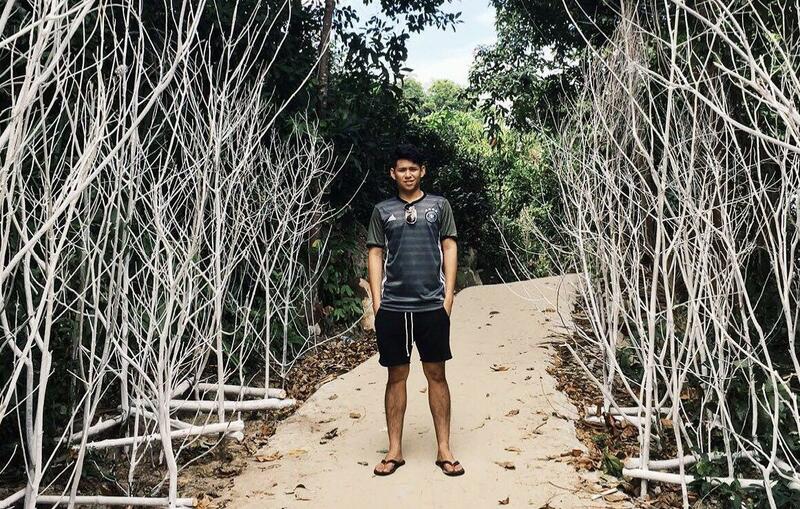 Even though it’s not new to everyone anymore, 24-year-old Ryan Lam started up Glamping City to provide more choice to customers and diversity to the glamping market in Singapore. 4 more days left till our Valentine's Day Special ✨Book with us today! Glamping City celebrated its first anniversary on Valentine’s Day this year. But before Glamping City, Ryan was already a serial entrepreneur. “I started working right after school and managed to kickstart my first delivery business at 20. [It was] the first business to create a new way of transporting goods, so I reckoned I could bring this business far,” he said. But his ambition was stopped short when competition became stiffer. It only occurred to me when I saw my income slowly deplete that I decided to embark in other businesses like retail, catering, web design. I nearly kickstarted an app. But that was eventually created by someone else a year later and was sold off for $300 million. For him, it was a huge setback. He told me that he took up his first full-time job at a shipping company after several attempts at entrepreneurship without much success. During the time when he was still working at the shipping company, he went to Indonesia with his girlfriend and experienced glamping there. His girlfriend came up with the idea to start a glamping company after the trip, which was formerly known as TheGlamCo.Events. “She singlehandedly managed the company before I joined a few months later, and we renamed the company to Glamping City,” he said proudly. They started up with $5,000 and used to handle everything about the business on their own. But since their recent recruitment efforts, they are now able to focus on their respective roles. “Customer service, values and profit (are important) to keep our business sustainable. Nothing less, only more,” he assured us. 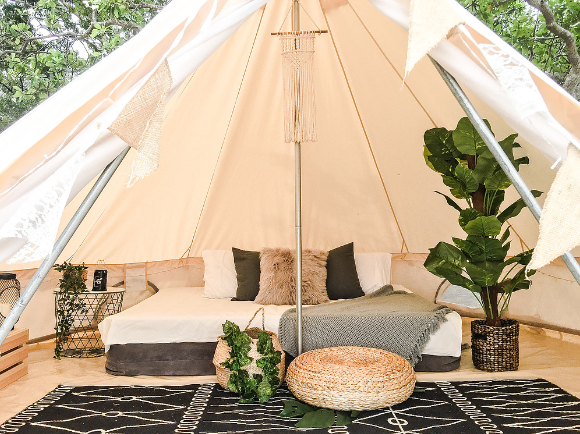 The tents look luxurious while being minimalistic (think Kinfolk), fitted with fairy lights, and comfy cushions and blankets. Details like a side table and an indoor plant make the interior of the tent look like homey. Ryan said inspiration for the interior came from imagining an “ideal bedroom” with different “moods”. But won’t this concept be easily copied? Yet, Ryan stands firm in his belief that they are unique. “Our tents are mobile and portable. We operate in an eco-friendly manner using zero electricity fuel,” he explained. They also offer a breakfast delivery service and help you with the booking of BBQ pits. He also promises more “distinct” features that can distinguish them “from other glamping providers in the upcoming months”. 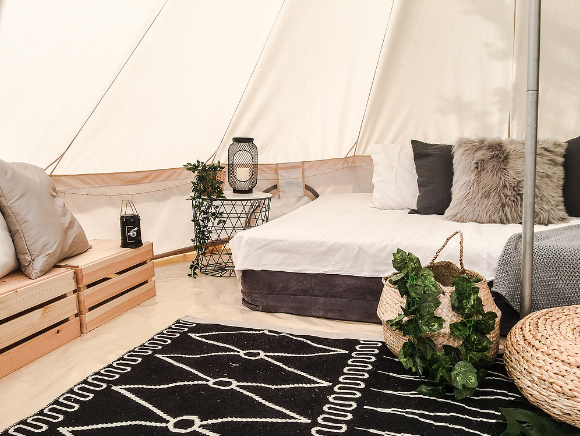 Glamping City lets customers choose from different themes, and even allows them to customise their own themes at added cost. “We curate and design packages and themes for different occasions and provide (a variety) of options for our guests,” he said. Ryan shared that because glamping was still a pretty new service, they were unable to identify the exact wants and needs of customers. So they had to “brainstorm on each and every customisation” to fulfil customers’ requests. “We managed to gather enough resources to pull through, and I would say team work helped us overcome many of the challenges we faced,” he said. He later observed that there were a higher percentage of millennials engaging their service. 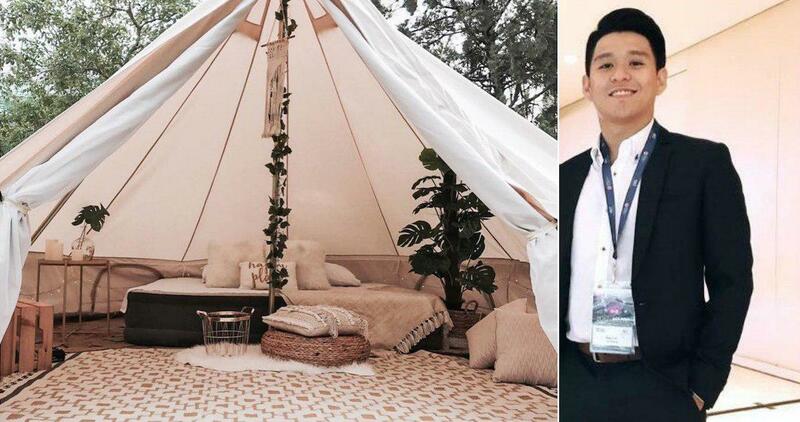 “Our means of marketing Glamping City is via Instagram, through the help of influencers and mostly through the word-of-mouth by patrons of Glamping City,” he shared. He recounted a happy memory made while running Glamping City. “The staff and myself even stayed overnight with them! But in our own tents, of course,” he laughed. He also recalled the time he and his team had set up a tent at a customer’s backyard, which was a fresh and fun experience. Receiving feedback and compliments from customers and vendors was “encouraging” and he takes them all into consideration. He won’t rule out collaborating with other businesses “in order to maximise everyone’s potential regardless of funds”, and thinks that a “great partnership” is one that can “boost” both businesses. Ryan claimed that a “handful” of interested investors came forward expressing their confidence in their business idea, and offered investments amounting “close to 6 figures”. Eventually, he also wants to build a ‘glamping village’ and provide better facilities, including air-conditioning. Ryan shared that his journey with Glamping City has been “quite exciting thus far”, growing from a one-man show at the start to a lean team of six full-timers and some part-timers who could “complement each other”. To find out more and book a stay with them, visit their website here. Follow them on Instagram here.